Carlos, 19, Mexico, from Chicago. 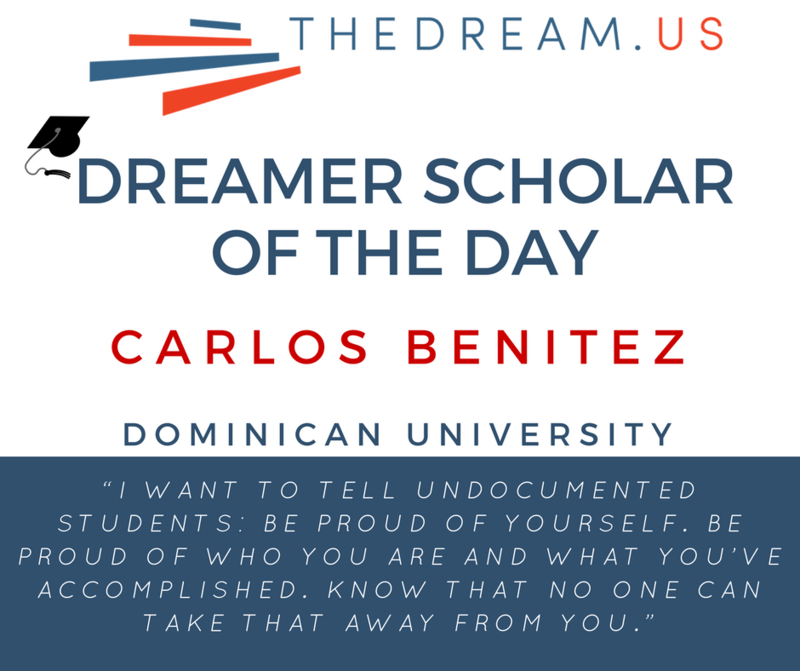 I think that DREAMers provide a unique view of life in America. Most of us have struggled, in a sense, and have very important experiences to bring forward to better our society. We are hard-working individuals who have so much to give. We just need the opportunity to do so. I always knew I was undocumented. My parents never hid it from me; they believed that it would always shape my identity, and to ignore it would mean undermining the struggles of our family. I think that growing up with this in mind allowed me to claim ownership of my own success, aspirations, and identity as a new American. America has always been my home because everything I know and love is here. I remember arriving in Chicago in the end of winter when I was four years old— snow was on the ground, a chill was in the air. It was wildly different from anything I had experienced in Mexico. Despite the adjustment to cold weather, I mostly had a normal childhood. I had a lot of friends around the block, I worked hard at school, and I did my chores. Although, I did have a lot of anxiety growing up. I was fearful that something would happen to my parents, or that I wouldn’t be able to help support my family. I saw the long hours my mother had to work to support us, and I feared she would somehow get hurt.My teachers and my peers were essential support systems as I got older. My teachers encouraged me throughout the years, validated me as a person, and fueled my desire to accomplish big things. Many of my teachers knew of my immigration status, and they assured me that I would be able to succeed despite any adversity. In high school, I also found support amongst my peers. I joined, and eventually led, an LGBT group at my school, called SAGA, whose purpose is to educate students and provide support to queer youth. We openly advocated for queer rights at school and participated in events throughout the city of Chicago. I was also part of the Army JROTC at my school and was the student commander of the program my junior year and chief advisor the year after. As a senior, I frequently volunteered as an activity leader at a community shelter near the school where I led art therapy sessions for the residents. In my last year of high school, I was also a founder of the DREAMers Club at my school and have kept open communication with the younger students. I want to use my education and experiences to create an outreach program for high school and middle school queer students to ensure they have resources and people they can trust and communicate with so they never feel alone. Additionally, I plan on keeping an open connection with my old school, and as many undocumented students as possible, to make sure they have the information they need to be able to go to college. I want to tell them: Be proud of yourself. Be proud of who you are and what you’ve accomplished. Know that no one can take that away from you.On a personal level, I hope my love and enthusiasm for education will encourage my older brother and sister to go back to school and inspire my little sister and nephews to take advantage of the opportunities they have. I believe it is inhumane to take away anyone’s access to education or make a living — we are all just doing our best to get by.